A 65-strong flashmob staged a friendly invasion of Camden Town Hall to celebrate February’s LGBT History Month – in a video featuring the mayors of Islington and Camden. Take a look. 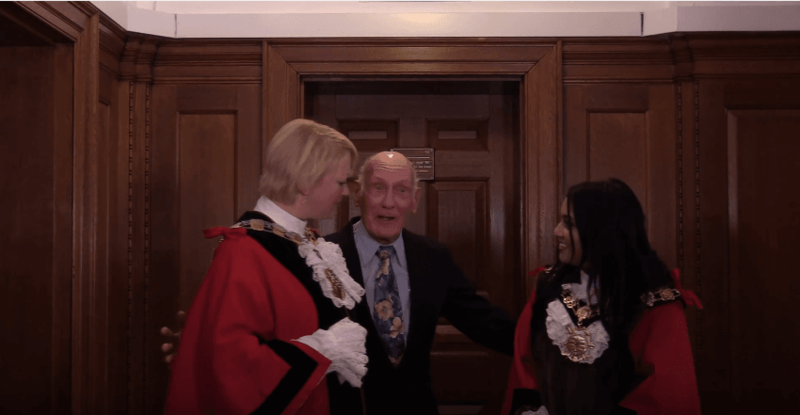 Islington Mayor Cllr Kat Fletcher and Camden Mayor Cllr Nadia Shah appear in the video, to celebrate, among other things, 50 years since homosexuality was partially decriminalised. It’s being marked in this month’s Lesbian Gay Bisexual and Transgender History Month. Camden pensioner Leslie Smith, 88, is considered the godfather of the film, spiriting the mayors away to make the secret feast possible, and later toasting the 50-year anniversary at the “secret flashmob feast”. Three Flying Piglets produced the short film for the Camden LGBT Forum. Patriic Gayle the film’s Director says, “I cannot thank all those involved enough, the Mayors’ Parlours particularly, some incredibly helpful Camden staff and FilmFixer who navigated our use of the Town Hall. FilmFixer manages the film office service for both Islington and Camden Councils. FilmFixer director Karen Everett says, “The clip manages to be good fun as well as to celebrate the serious issue that homosexuality was partially decriminalised just 50 years ago in this country.